For all the attacking flair on display last season at the Etihad, there was one man who captured the hearts of City fans for with his relentless work ethic and robotic consistency. Fernandinho may not have received the plaudits his midfield counterparts did last season, but Pep Guardiola was a keen admirer, heaping the Brazilian with praise throughout the season. 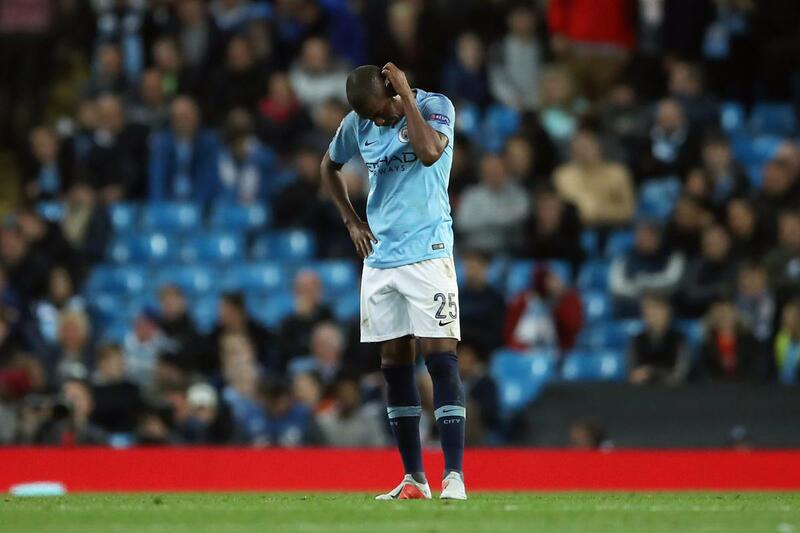 Yet this season, the early signs are that City fans’ worst fears may be coming into fruition: a 33-year-old Fernandinho is naturally regressing and the club have no clear replacement. After being subject to intense criticism from Brazilians due to his poor display in the World Cup quarterfinal against Belgium, it seems Fernandinho has brought his sluggish form into the new season, after he was dominated by the young, bullish midfield of Lyon in the Sky Blues’ Champions League defeat. Of course, we can’t be too harsh on the midfielder; age is catching up on him and he’s had little rest in the past 18 months. But this season should have been the time for him to be utilised as an experienced mentor for some new younger, fresher legs in the number 6 role, much like Vincent Kompany was to John Stones and Aymeric Laporte last season. Fernandinho was by no means flawless last season–he was exposed massively at Anfield by their relentless pressing, and it was clear on that night that there was a key weakness in his game; progressive passing. More specifically, he failed to bypass a press as aggressive as Liverpool’s. With Guardiola accustomed to the likes of Sergio Busquets and Xabi Alonso cracking through presses with one simple masterstroke of a pass, Fernandinho’s lack of creativity left much to be desired on that fateful night in Liverpool. On that showing, and also with his age in mind, it was imperative that City bought a defensive midfielder in the summer, not only to increase depth in the position, but to upgrade on Fernandinho, and in the long term, become his successor. Of course, we now know City failed to capture any of their targets, including Fred and Jorginho, who have now been snapped up by City’s direct rivals. There seemed to be a huge split between City fans over whether it mattered. Many think we are now “spoilt” to even think about being upset about having Fernandinho as a starter still, and whilst we may retain the title with him as the main #6, we will not win a Champions League with a 33-year-old playing 40 games a season. We are now in the third season of Pep Guardiola’s time at City; by the end of his second season at Bayern, he had already reached the Champions League semifinals twice, only to be denied by the eventual winners. By the end of his second season at Barcelona, he had already won the treble, and barely capitulated to José Mourinho’s treble-winning Inter Milan the following season. If City are to follow in the footsteps of the Catalan’s previous European feats, they must invest in a holding midfielder. So how does Pep solve this Fernandinho conundrum? The most obvious candidate to play in the number 6 role would be a man who did it very successfully last season in İlkay Gündoğan. In games against Spurs and Chelsea (the latter in which Gündoğan broke the Premier League record for completed passes), he oozed class in the middle of the park, offering far better progressive passing than Fernandinho does. Given his superior creative output, City should be trying this option more often as Pep clearly wants a more progressive player in the role, as suggested with the interest in Jorginho and Miralem Pjanić. However, it must be said that what the German makes up for in forward thinking, he lacks in defensive output, as he completed significantly less tackles than Fernandinho last season and does not possess the impressive engine that the Brazilian does. Overall, this one has more pros than cons, and is probably the best option Pep has right now. A more unorthodox option, if not desperate one, would be to try John Stones in the role. This is an idea City fans on Twitter have flirted with for a while now, and it seems Pep might just be open to the experiment, having trialled it against Oxford and also towards the end of the game against Newcastle. Stones maintains an impressive pass completion rate from centre back; last season, he completed 3.4 long balls per game and overall around 70 passes a game. Despite having a similar physique to Busquets, Stones simply isn’t mobile enough or a good enough reader of the game to make up for his lack of pace. While Pep may continue to experiment with this against weaker opposition, this is not a feasible long-term option. If squad depth ever becomes seriously thin, Pep may look to highly rated French youngster Claudio Gomes or even utility player Oleksandr Zinchenko, who often gives City a more creative spark when deployed at left back, boasting an impressive passing range, especially when playing long diagonals into the right flank. Naturally, the Ukrainian is a central midfielder, so he may possess more tactical intelligence than the likes of Stones, as well as being more mobile. Whilst he has impressed Pep as an inverted fullback, his defensive output still leaves a lot to be desired, but he could be an emergency option if desperate times call for desperate measures. With Benjamin Mendy returning to the side at the start of this season, Guardiola switched to a 3-5-2 with wing backs. Whilst this has never really been discussed before, would City really need a destroyer like Fernandinho with 3 centre backs behind him? No. They would need a player with excellent stamina, decent defensive output, and the ability to start attacks from deep. For that role, Kevin De Bruyne is the perfect candidate. The Belgian is no longer a second striker or inside wide player like he was when he first arrived from Wolfsburg; he is now a full-fledged central midfielder who has few, if any, weaknesses. We all know how extraordinary his creative output is, but what goes under the radar is that he made 62 tackles last year, which was actually the same as Fernandinho. He certainly has the skillset to be the quarterback of City’s midfield, whilst also winning the ball back within seconds of losing it due to his intense pressing. Whilst these options could prove to be the solution to Pep’s problems, it is more likely that City will turn to the transfer market in January to fill the hole in midfield. Reports suggest City have been in talks with Adrien Rabiot, who is out of contract in the summer and reportedly wishes to leave PSG. Whilst the Frenchman is still young, his recent poor performances on the big stage against Real Madrid and Liverpool suggest City could do better. Rúben Neves is an option City may explore in January given his near-superhuman passing range, a trait that Fernandinho certainly doesn’t posses. Unfortunately for Guardiola, Wolves will do everything to hold onto Neves, given their ambition and financial advantage over the other non-top six teams. Nobody knows who or when City will find their long-term mediocentro, but there is one certainty of whom they should buy: Frenkie De Jong. Strong and commanding off the ball whilst elegant on it, the Dutch starlet would be a perfect fit in the holding role. The only thing that would stand in Pep’s way would be his former employers Barcelona, but City may be less likely to haggle over the price, and more likely to cough up whatever Ajax are asking for their prized talent. Until then however, City should be okay. They aren’t in a crisis, yet.